Pipestem Resort State Park in West Virginia is investing $11 million into updated accommodations and new outdoor adventures, including a zip line. The investment, funded by state bonds approved by the West Virginia legislature, is aimed at fueling the state’s tourism industry. 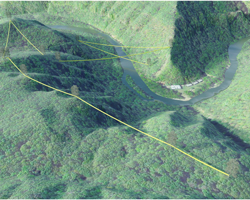 West Virginia State Parks has partnered with Bonsai Design to build a zip line attraction featuring nine different lines that allow participants to zip along the Bluestone River Gorge ridgeline and across the gorge itself. The course will cross the river three times at heights of more than 300 feet, finishing at the base of the gorge at the park’s lodge. The new zip line is scheduled to open in April 2019. The zip line is only one part of the improvements. The state park has also partnered with ACE Adventure Resort to operate the zip line and offer a splash park, lake adventures, guided fishing trips, kayaking and standup paddleboard rentals, rock climbing and rappelling instruction, guided mountain bike excursions, and tubing and whitewater rafting. The $11 million investment will also go to cabin modernizations, campground upgrades, water and wastewater plant replacement, and tram renovations, all scheduled to be completed in 2019.